As mentioned, there were multiple waves of swimmers. They had the racers go over the either the wet suit or non-wet suit timing mat and then swim out to the starting line. We then treaded water there until the gun went off and we were off. For the first five or so minutes, I was breathing every other stroke. This is the same thing I did during the Giant Acorn triathlon. I eventually forced myself to calm down and swim at a nice even pace and concentrate on my breathing. Once I was able to do that, the rest of the race was much more pleasant. While this was a race, I did not treat it as such. For me, it was more of a learning experience. I felt comfortable sighting, I swam relatively straight, and I got my breathing under control. I'm really looking forward to running the Giant Acorn again and see how much I can improve my swim time there. 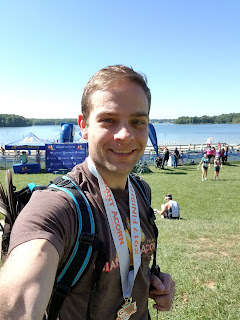 In this race, I could have picked up my pace some, but I simply don't have enough experience to know how hard I can push myself for these longer distances - it's amazing the differences between pool and open water swimming. 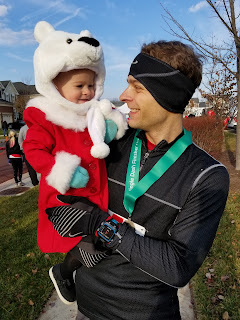 I'll do this race next year for sure, hopefully with my wife, if we can get a babysitter for the event.